Although it is made from wheat, seitan has little in common with flour or bread. Seitan becomes surprisingly similar to the look and texture of meat when cooked, making it a popular meat substitute. It is also called gluten, wheat meat, wheat protein, or wheat gluten. Seitan is the base for several commercially available products such as Tofurky deli slices and other vegetarian meat substitutes. Similar to the way tofu is used, many vegetarian and vegan recipes call for seitan, such as in a seitan stir-fry or grilled seitan. Seitan is high in protein, making it a popular protein source for vegetarians and vegans. One ounce of seitan provides 21 grams of protein. It is very low in carbohydrates (4 grams per ounce) and fat (0.5 grams per ounce). A drawback of seitan is that it is gluten, so it must be avoided by those on a gluten-free diet. Seitan has a savory taste, probably closest to bland chicken or a portobello mushroom. Seitan has a mild flavor on its own but can take on many more flavors from different recipes. It can be hot and spicy as in seitan "chicken wings" or savory in a succulent Indian or Thai massaman curry. 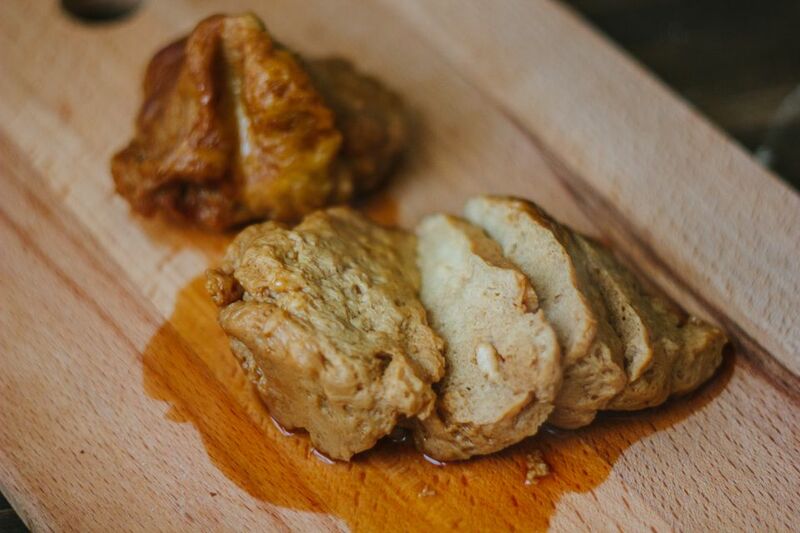 The popularity of seitan is due more to its texture rather than its taste. This is especially true when compared to other alternatives, such as tofu or tempeh, which don't have a "meaty" texture. Prepared seitan can be found in the refrigerated section of most health food stores. It is usually in a tub similar to the way tofu is sold, or sometimes in sealed plastic inside a box. Seitan can be prepared by hand using either whole wheat flour (which is a very labor-intensive process) or vital wheat gluten (which is a much simpler process). It is made by rinsing away the starch in the wheat, leaving high-protein gluten behind. When you are eating out, seitan is quickly gaining popularity in vegetarian restaurants. You'll find it thinly sliced as a meat substitute on vegetarian sandwiches, turned into saucy and succulent wings or "ribs" and as a vegetarian pizza topping. Asian restaurants often use seitan as a vegetarian mock meat. Whether you make it or purchase it ready-made, seitan always needs to be cooked to use it in a vegetarian or vegan meal. A quick pan-fry with a splash of tamari, soy sauce, or nama shoyu is one way to cook your seitan. You can simmer it with a bit of curry powder and top it off with nutritional yeast for an enjoyable dish. Seitan is great grilled, whether on an outdoor grill or an indoor grill pan. Just top it with your favorite barbecue sauce and heat it up. A barbecue seitan sandwich is a delicious and fun option for your cookout. Toss seitan into a pan to get it lightly browned before you add vegetables to make a vegetable stir-fry. You can add seitan to just about any vegetarian curry recipe, or add bits to a soup or stew for a plant-based protein boost. Once you get started, you will find many creative ways to use seitan in your vegetarian and vegan cooking.